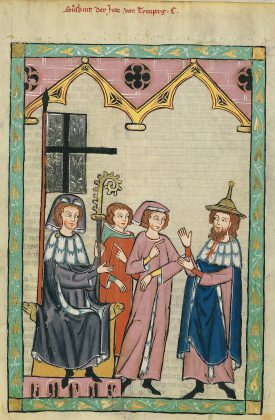 Jewish craftsmen and merchants settled in Switzerland’s Roman cities between the third and fourth centuries, but the first documents that mention them date only from the thirteenth century. Throughout the following two centuries, Jews were regularly accused of ritualistic crimes on Christian children and poisoning wells. They were expelled from the cities during the period 1384-1491. Certain families, however, benefited from the tolerance of local authorities. Communities began to reform only in the early nineteenth century on the initiative of Alsatian Jews. The Jews of Switzerland were among the last in Europe to gain political equality, under foreign pressure in 1866. A popular vote in 1893 forbade ritualistic slaughter in Switzerland. This ban is still in effect, and kosher meat must be imported. Switzerland supposedly neutral stance during the Second World War gave rise to an immense debate in 1995: substantial historical research showed that the Swiss government had adopted an anti-semitic asylum policy during the war, driving back thousands of refugees by requiring that Germany issue a “J” stamp on the passports of its Jewish nationals. Swiss banks finally admitted having wrongfully confiscated accounts belonging to victims of the Shoah, while insurance companies were accused of failing to pay premiums to the appropriate parties after the war. This profound reevaluation of Swiss history, previously shrouded in the myth of neutrality, resistance, and humanitarian intervention, gave rise to a strong tide of anti-Semitism, stirred up by declarations from high political officials relayed in the media. Used to a low profile, Switzerland’s small Jewish community (18000 people) suddenly found itself on the front lines, squeezed between the demands of Jewish organisations and the reluctance of Swiss institutions. Several years of dialogue will be needed for anti-Semitism to abate in Switzerland. Edmond Fleg, whose real name was Fleigheimer, was a novelist, poet, and thinker born in Geneva in 1874. Until his death in 1963, he fought for the Jewish cause within the context of the Jewish Scouts of France, the Universal Jewish Alliance, and the Judeo-Christian Friendship. “I am Jewish because wherever suffering weeps, the Jew weeps. I am Jewish because whenever despair cries out, the Jew hopes. I am Jewish, because the word of Israel is the oldest and the newest. I am Jewish because the promise of Israel is a universal promise”. Edmond Fleg, Pourquoi je suis Juif (Why Am I Jewish), Paris, Les Belles Lettres, 1995.